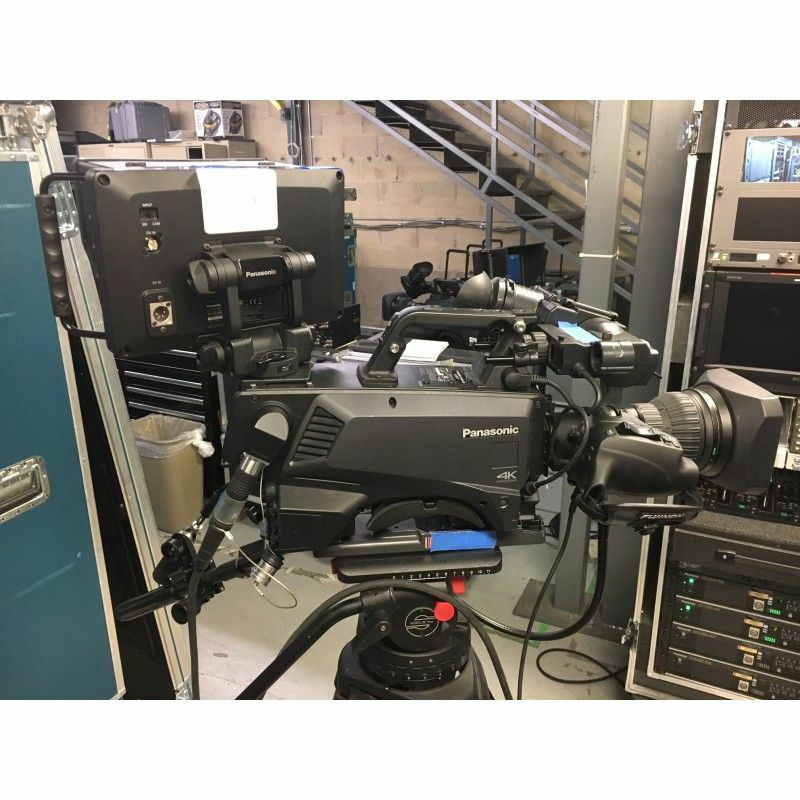 Up for offer is a 12 pcs Panasonic AK-UC3000 4K/HD Fiber Studio Camera Package This system is like new and has very little use. 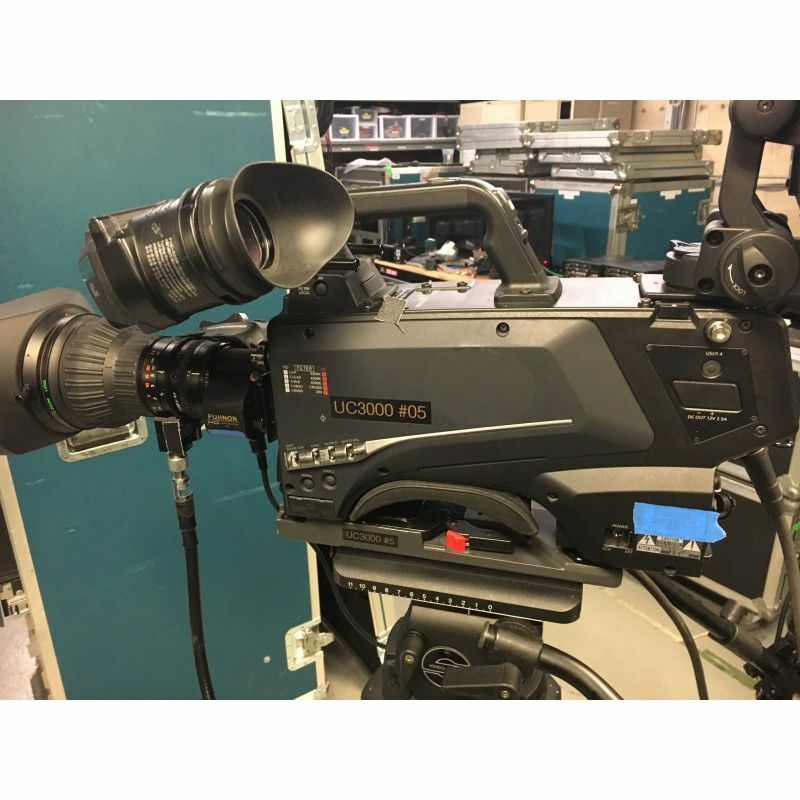 The Panasonic AK-UC3000 4K Studio Handy Camera with LEMO CCU Connector is a professional, multi-format camera that captures 4K UHD, 1080i/p, or SD video using a single MOS sensor. 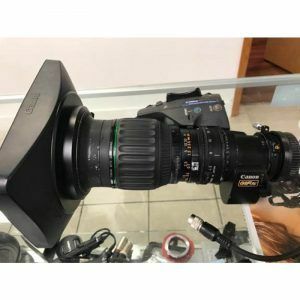 It features a B4 mount, and integrates a conversion lens system that allows you to use virtually any 2/3″ format ENG lens to cover the large-format sensor. The camera can capture at NTSC or PAL broadcast compatible frame rates. The camera is designed for studio work and does not incorporate a recorder, instead outputting via 3G-SDI outputs or the fiber optic connection. 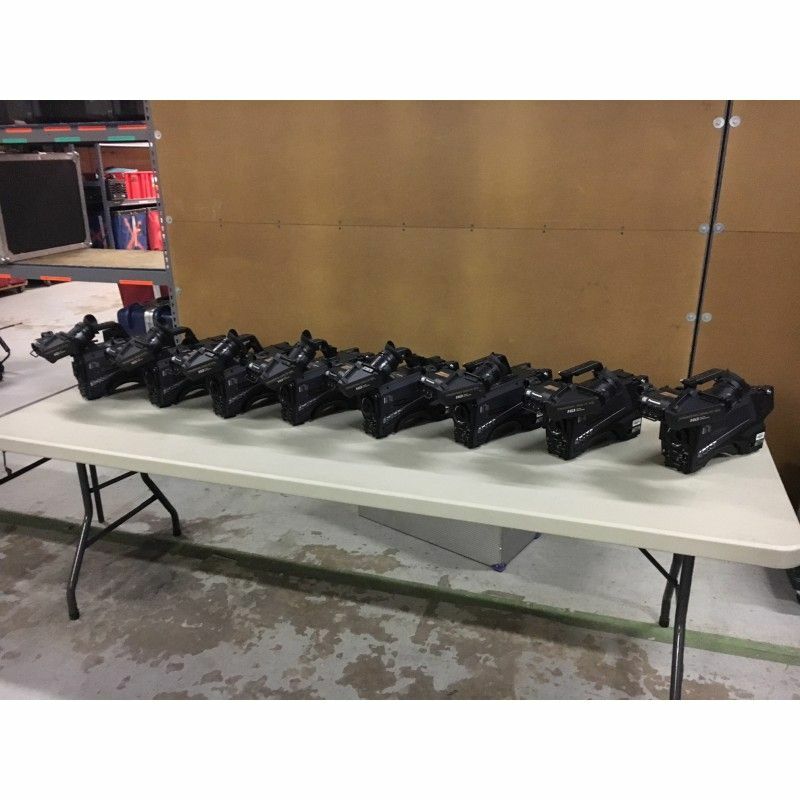 It can also be used in a hand held configuration while retaining the same output capabilities. It captures images at up to 59.94 fps in both 4K UHD and HD, and it features a hi-speed mode that allows you to capture at 239.76 or 200 fps in HD depending on what signal format you are shooting. A variety of image controls allow you to adjust the image quality, with such high-performance functions as dynamic range stretch, cine gamma curve, skin tone detail correction. Independent servo controlled ND and CC filter wheels provide creative opportunities to handle a wide variety of shooting conditions. A LEMO connector enables an optical fiber cable connection to an optional CCU that increases the camera’s flexibility. An integrated conversion lens allows you to directly use 2/3″ lenses with the camera without an external optical adapter. The converter lens expands the image to cover the large-format MOS sensor and compensate for the lack of prism block. The camera can connect to an optional AK-UCU500 CCU over 6500′ feet away via a fiber optic cable. 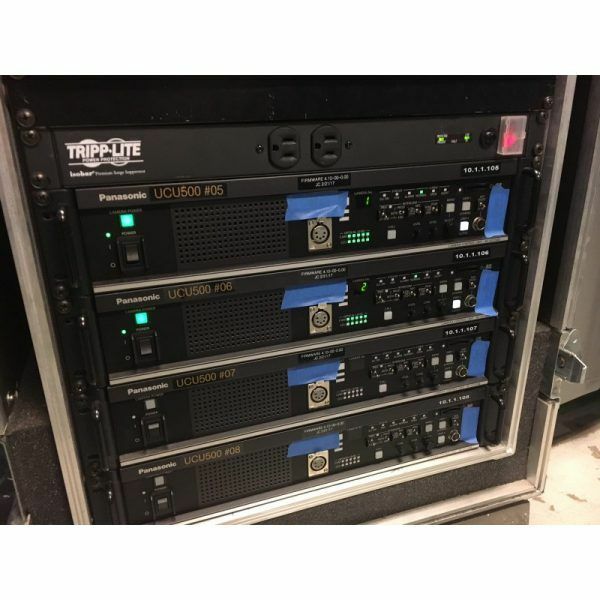 Using an external power supply and general-purpose optical fiber transmission device (not included), enables the CCU and camera to be separated by over 32,000 feet. With the addition of an optional AK-UCU500 CCU, the camera can output 4K UHD, as well as HD/SD video simultaneously. UHD video is output from the CCU, while the camera outputs HD/SD via its built-in 3G-SDI BNC outputs. The DRS function is available when capturing in HD. It automatically lessens the appearance of blocked shadows and blown highlights when dark and bright areas are mixed in the same scene. This provides a more natural looking image. The rolling shutter artifact has been reduced by reading out the MOS sensor signal at high speed. In addition, using a camera-signal-processing LSI high-precision flash band detection and compensation function, Panasonic was able to eliminate the flash band phenomenon (light and dark areas appearing in the same frame) that occurs when a flash goes off during shooting. The AK-UC3000 camera system is able to record 1080p at up to 239.76 fps when recording in NTSC compatible (60 Hz) mode, or 200 fps when recording in PAL compatible (50 Hz) mode. Depending on your playback frame rate (59.94/50/29.97/25/23.98) this translates into between 4 and 10x slow motion. Please note that additional equipment (not included) is required to record the high-speed video. This feature engages an algorithm to compensate for the chromatic aberration of select lenses, allowing the camera to capture sharper images with reduced chromatic aberration. You can choose from Film Rec (V-Rec or F-Rec), and film-like 1/2/3 to fine tune the image you are capturing. Access to a built-in 12-axis color correction matrix enables fine tuning of the hue and saturation of individual colors, allowing you to tweak the standard EBU or NTSC color correction presets. This function allows you to adjust the detail level of skin tones, using two discrete types of correction, so you can soften the appearance of wrinkles and skin texture. Adjustments can be made to the entire hue phase, so you can apply it to skin tones of all kinds. You can also apply the detail correction to specific colors even if it is not a skin tone. Video and data can be transmitted between camera and a CCU (camera control unit) using an optical fiber cable. This allows you to match system expansion to operation conditions. 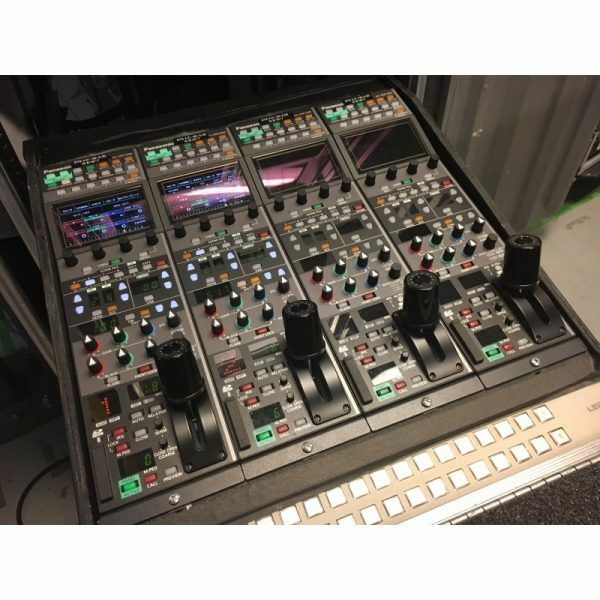 HD-SDI (CCU camera) two lines, VBS (CCU camera) two lines: Can be used for monitoring with prompter or camera (studio floor monitor), etc. 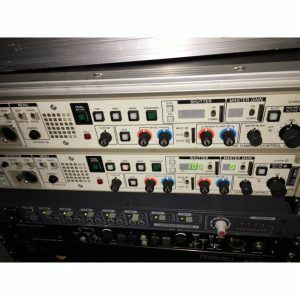 HD-SDI (camera CCU) one line: This line can be used to transmit an additional video signal of a handheld or remote camera to the studio. Since the camera video input is equipped with a frame synchronizer, asynchronous video signals can also be used. LAN (1000BaseT) one line: To be used to control external devices and remote cameras by IP protocol. Transmission of streaming video is also supported. DATA (RS422A or RS232C) two lines: Can be used to transfer lens and pedestal position data in a virtual system. Incorporating two independent motorized filter wheels allows you to make in camera adjustments of ND (exposure) as well as color temp/effects/diffusion. The ND filter wheel features a Cap (no light pass through), clear, 1/4, 1/16. and 1/64, while the color correction wheel features cross, diffusion, 3200, 4300, and 6300K. The camera features two independent intercom channels, Intercom 1 and Intercom 2, in addition a mix mode allows you to listen to both intercom channels simultaneously. 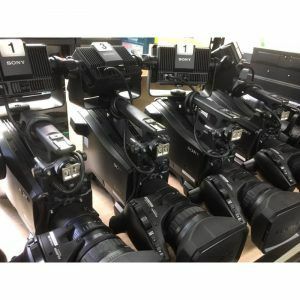 The camera’s low-profile design makes it easier to see to the right of the camera, and the shoulder pad features approximately an inch of adjustment for fine tuning the camera’s balance.